Thread: Sveinshaven - Good Aligned Viking-based RP tribe. It may have been the mushrooms. Not much else could be found to eat besides the little green fungi clinging to my cave’s glistening stone walls. Snow lay thick outside, hiding the lake’s frozen surface and painting the landscape in harsh shades of white. Weeks had past since I’d seen a single deer. It may have been starvation. Or sheer, utter boredom. There are only so many types of baskets one can weave using dead straw while waiting for the spring thaws. Only so many times you can sharpen a piece of scrap metal against stone. Not much to do but think. Ponder. How do I even know the word ponder? The campfire burning weakly inside my little cave did little to dispel the crushing gloom and suffocating numbness. It barely kept the snow at bay just beyond my refuge. The flames erupted far more violently than spitting animal fat or dry tinder should allow, billowing upwards until it scorched the cave’s low roof and flooded its interior with raw heat. I squinted against the sudden glare, struggling to see through the blaze and determine its source. Outside the snow had taken on blood red hues from the fire’s wrath. Inside the cave pulsed with waves of pressure and force. The figure that stepped from those flames was tall and strong with pale flesh and long, golden hair. Much like my own. Black furs and straps of rusting metal did little to cover her muscular form. Bare feet stepped from the fire’s core. A spear extended from one hand, wicked blade glistening in firelight that slowly died. It pointed towards me as she spoke in a language I’d never heard but somehow understood. I didn’t understand a thing she said. Nothing made sense. Not her appearance. Not her words. Nothing. Then again, nothing made sense before she arrived either. The spear lashed out and slashed across my throat in one fluid, effortless gesture. Blood filled my lungs and the world exploded in pain. Still, I could hear her words above my own gargling death when she spoke. Could feel her bare foot as it stepped on my chest and the spear’s point pricked my forehead. Of course I woke up face down in a puddle of my own drool. The fire had long died, leaving my cave in cold darkness. No gaping would at my throat. No half naked Valkyrie speaking nonsense towered over me. Just me in a cave. I rolled over, found my flint and steel, and grabbed the last dry wood left for a fire. Shivering, I stirred the ashes, hoping for a few glowing coals to make life easier. Instead I found a single acorn nestled amid charred bones and blackened twigs. From its hard surface rose a green shoot. Needless to say, it freaked me out. I planted it anyway. You just never know. Purpose: To provide a friendly, relaxed and casual role-playing environment within the Xsyon setting. RP Flavor: We're aiming for a Norse/Viking influence with a modern twist. The Xsyon setting allows for plenty of creative freedom. We don't have to play cultures straight from the history books. Vikings using rusting car doors as shields with war axes whose blades came from scrapped wood saws sorta shatters the notion that the tribe will be 'pure' Viking. So we're shooting for Viking flavored post apocalyptic survivors. Religion is a deeply personal thing, both in real life and for our characters in the game. According to the game's setting literature, the Gods have reawakened, wiped the area clean, and plopped us down in the valley with little or no memories of the world before. That's a pretty direct, and massive, act of divine intervention. Hard NOT to RP some sort of religious aspect then. 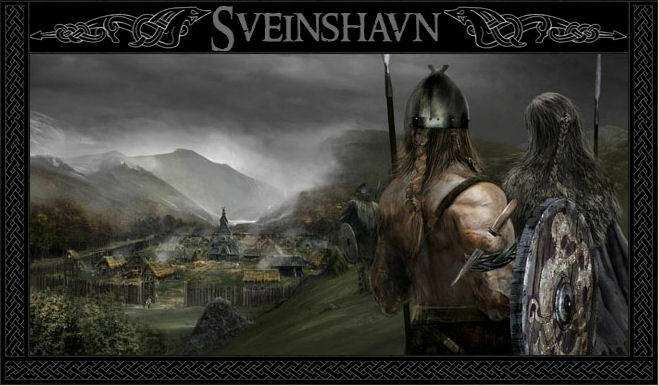 Therefore Sveinshavn will partake in some of the old pagan practices of the Vikings, Germanic and whatever else seems to 'fit', and form its own eclectic religion. Village building: More here in a bit. Ragnarök and Fimbulvetr: In Norse mythology, Ragnarök is a series of future events, including a great battle foretold to ultimately result in the death of a number of major figures, the occurrence of various natural disasters, and the subsequent submersion of the world in water. Afterward, the world will resurface anew and fertile, the surviving and reborn gods will meet, and the world will be repopulated by two human survivors. Prior to Ragnarök will come a time known as Fimbulvetr, the harsh winter that precedes the end of the world and puts an end to all life on Earth. Fimbulwinter is three successive winters where snow comes in from all directions, without any intervening summer. During this time, there will be innumerable wars and brothers will kill brothers. And here we are, newborns within a world wiped clean by mankind's brutal depravities and awoken Gods who would tolerate them no more. No site info for joining?